Most readers seem to have a fascination (if not semi-obsession) with where writers write. I think it's more of an interest in seeing and understanding the intimate space in which writers create, that world where writers go to leave this one behind. I have long held that fascination, too. As many of you know, Erma Bombeck remains an idol of mine, and I loved to read about how she locked herself away from her family to write undisturbed (save for the notes under the door). I have a plaque on the wall next to my desk of Margaret Mitchell which reads, "In a weak moment, I wrote a book." I love the saying, but I also love the photo on the plaque of her in her office sitting at her desk -- hands fluttering over her typewriter. I often love to sneak a peek into authors' writing spaces, both personally and electronically. One of the first things I wanted to see when Rita Mae Brown -- the legendary author of RUBYFRUIT JUNGLE and The Sneaky Pie Brown Series -- invited me to stay at her beautiful Virginia farm was her office. It was a bright room, with big windows, and a beautiful, old desk. On top? A typewriter. Rita Mae had nothing else in there: No lap top, no phone, no cell, no internet. She said she rose at dawn with the sun, and got her writing done, so she had most of the morning and all day to tend to her many animals. I think my agent and editor would murder me if I sent in a typewritten manuscript, but it is RMB after all. But, I did learn something: I rise early, too, like she does, and write. And I have learned to turn off social media when writing (and leave my cell behind, too). 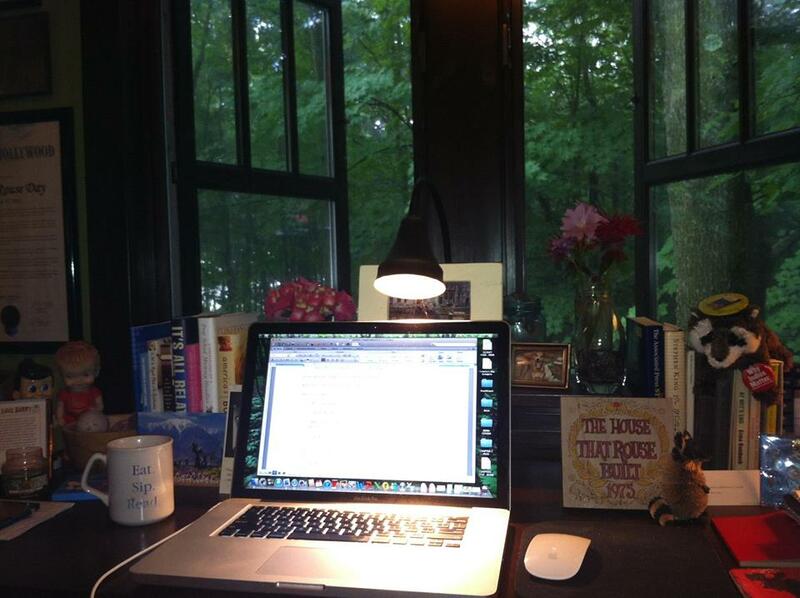 Though I have not visited their homes, I know many author-friends, like New York Times bestsellers Adriana Trigiani and Caroline Leavitt write from urban spaces while Nancy Thayer writes from her cottage in Nantucket (in an office with views of the water). 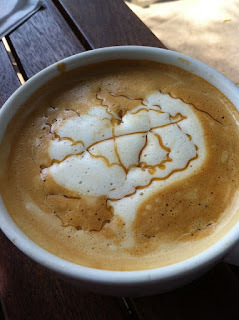 I know authors that prefer to make their offices in a local coffeehouse or library. My space is very important to as both a writer and a person: Our home is a knotty-pine cottage we call "Turkey Run," for all the wild turkeys who treat our paths and yard as their personal woodland interstate. 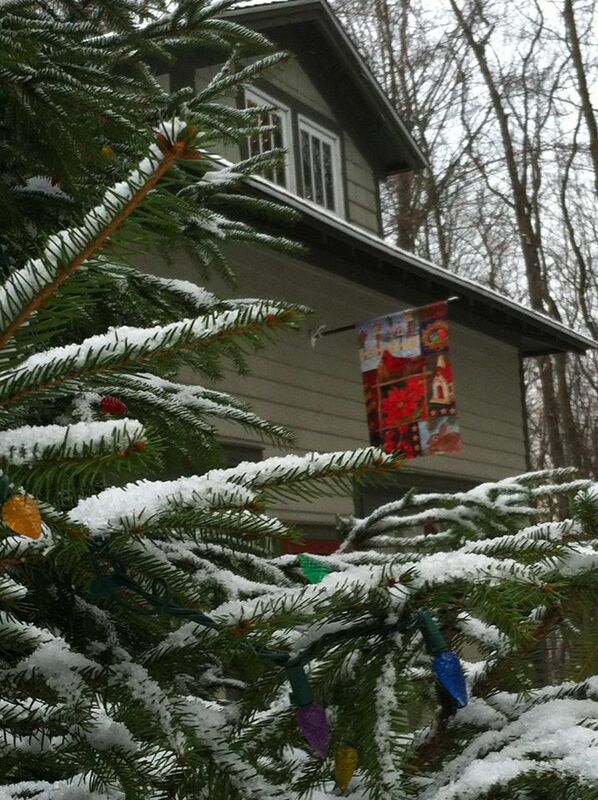 I love my cottage, its history and its feel. It grounds me, as does Gary's gorgeous gardens, from which I pick fresh flowers for my office two or three times a week. 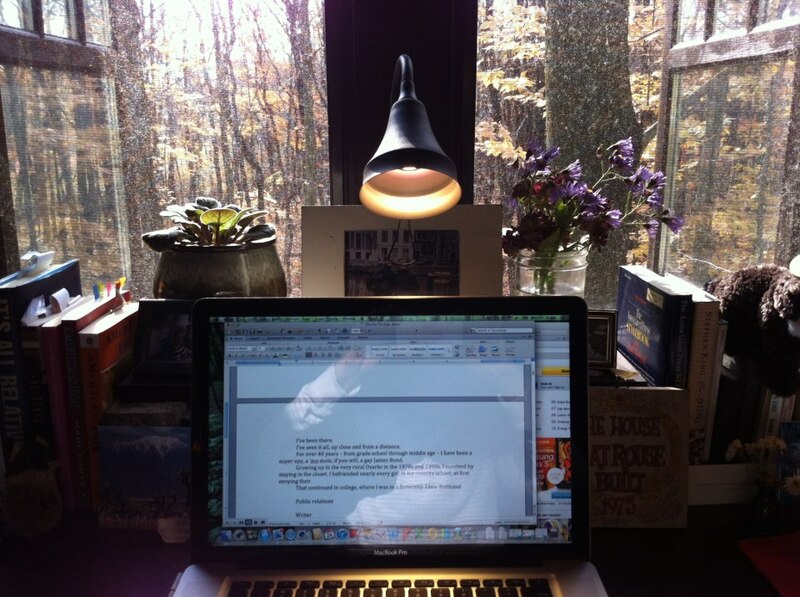 My writing studio is a carriage house attached to our house. It is private, quiet, and -- the nice thing is -- I can leave it when I'm done for the day: I can return to this world. My desk sits facing two giant windows overlooking our woods and -- in the distance -- our neighbor's blueberry fields. The view is constantly inspiring and ever-changing: Summer screams green, and the windows are constantly wide open. Fall is a wonder of color, the sugar maples and sassafras visual overload. 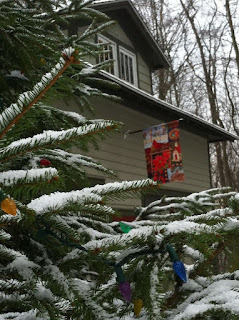 Winter is quiet and white (before we leave for the desert). And spring is nothing to everything all at once, an unfurling of Mother Nature. A huge sugar maple sits outside the windows, and a squirrel I call Dorothy Parker visits me nearly every day, eating acorns, staring at me, squawking at me to keep going. and one from Oscar Wilde that reads, "Be yourself, everyone else is already taken." I have bookshelves filled with books, family heirlooms and photos, and my expansive Pez collection. A lamp with that looks like burnished wood sits by my desk. I have a couch behind my desk that serves as a comfy place for writers who take my writing workshops to sit (and sweat ... just joking) when they come to my retreats. (btw, I NEVER nap, so it's of no use to me). The walls around my desk are filled with framed accomplishments (my bachelor's and master's degrees, my first marathon medal with official time and photo at the finish line), some of my first published magazine articles, as well as a number of framed quotes. The first quote is from Dr. Seuss and states: "The more that you read, the more things you will know. The more that you learn, the more places you'll go." The next is: "Do not go where the path may lead, go instead where there is no path and leave a trail," from Emerson. It was a quote given to me by Gary that helped to inspire, both humorously and poignantly, my Michigan memoir, At Least in the City Someone Would Hear Me Scream. And, finally, from Erma Bombeck: "Great dreams... never even get out of the box. It takes an uncommon amount of guts to put your dreams on the line, to hold them up and say to the world, 'How good or how bad am I?' That's where courage comes in." At the top of the stairway are two leather chairs I call my Hemingway chairs and a leather ottoman that flank a fireplace (which gets a lot of use in the fall and winter). There is a pouf for our smaller mutt, Doris, that sits under my desk, and larger pouf for her sister, Mabel, right next to my chair. I have a stereo that I occasionally turn on to classical, jazz or Pink Martini (but I am noise-obsessed when I write, and must have complete quiet ... which is why Gary leaves every morning to go to yoga and coffee). I love my office. I love going to work. My commute is short -- a stop for coffee, a stroll in our walkway past our woods and then up 14 stairs -- but I love every step. 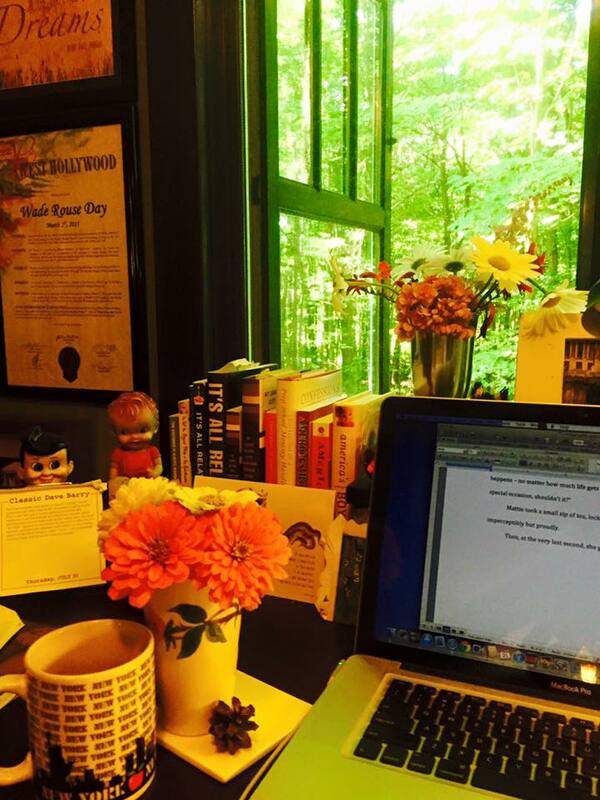 A writer's space -- any artist's creative lair -- is a special place. 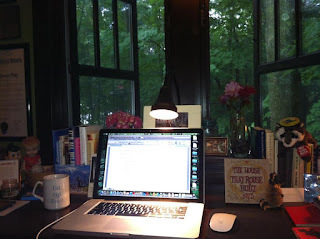 I encourage aspiring and emerging writers to give themselves not only permission to call themselves writers but also to carve out a space that belongs to them -- be it at the dining room table, a desk in the laundry room, or in the sunroom (the place I first started in St. Louis). Claim it! Call it yours! Even over the shouts of your husbands, wives, children. Over time, it will call to you. Over time, you will return, and you will create. And, over time, your dream space and dream book will become reality. It is an amazing resource of information for my working. Thank you so much. Your text has become a very good motivator for me to improve my skill of writing texts, because before that I usually order them here essays.io/ because it is very convenient and cheap and saves time. Great to see that you have such a great respect for Writers. I personally do Essay Writing & now I can be proud of my work! That is a great tip especially to those new to the blogosphere. Simple but very accurate info… Thanks for sharing this one. A must read post. It's great that people do few things without asking much about the circumstances. This can happen, but I am not sure if it will be viable. I did research paper help on this topic and found it really heed towards the elders. This is beautiful! Now I see why your books are so popular, you put your soul into every tiny thing that comes around you. You take things and create an atmosphere. Magician! I'm sure you would have made the best essay writer giving service that customers would never forget. Have someone from https://alltopreviews.com/ called you yet? If you cannot find the right place to go so you need to click the source that you have now and make your decision by taking advises from the experts there so you can decide in the best interest of yours. Writer writes according to their best approach. They just need to have time and also they visit homepage for differnet reasons. Indeed there is best kinda writig posted and i i am loving this site http://www.biographywritingservices.com/what-makes-great-executive-biography/ for sure. I think these sources can help students a lot in all possile ways. The writers have always unique contents of their own and they try to hide that form others because they have to visit https://www.bestparaphrasingsoftware.com/best-online-paraphrasing-tool/ as well and make their decision according to the readers' demand and let them make the reviews about the contents they have made. Hello all my viewers,my name navian This is my testimony on how i won $310.5 Million Powerball Jackpot lottery.I want to use this opportunity to thank dr clement for casting winning spell for me to win the lottery of $310.5 million lottery ticket.I have been playing lotteries for the past 4 years now and i have never be able to won any lottery. Ever since then i have not been able to won any lottery and i was so upset and i needed help to won this mega million lottery.so i decided to go online and search for help,there i saw so many good testimony about this man called dr clement of how he has cast lucky won number spell lottery for people to win the lottery. I contacted him also and tell him i want to win the powerball jackport,he cast a spell for me which i use to play and win $310.5 million dollars in powerball jackport. I am so grateful to this man,just in-case you also need him to help you win,you can contact him through his dralmightyspellhome@gmail.com and he will surely help you just the way he has helped me.i will forever be grateful to him and always testify the good work of him to the hole world. contact him via :dralmightyspellhome@gmail.com or call his phone/whatsapp +2347051758952 and he will surely help you to win any kind of lottery? 17. CURE TO ALL KIND OF DISEASES. Hello all my viewers,my name navian This is my testimony on how i won $310.5 Million Powerball Jackpot lottery.I want to use this opportunity to thank dr clement for casting winning spell for me to win the lottery of $310.5 million lottery ticket.I have been playing lotteries for the past 4 years now and i have never be able to won any lottery. Ever since then i have not been able to won any lottery and i was so upset and i needed help to won this mega million lottery.so i decided to go online and search for help,there i saw so many good testimony about this man called dr clement of how he has cast lucky won number spell lottery for people to win the lottery. I contacted him also and tell him i want to win the powerball jackport,he cast a spell for me which i use to play and win $310.5 million dollars in powerball jackport. I am so grateful to this man,just in-case you also need him to help you win,you can contact him through his email:dralmightyspellhome@gmail.com and he will surely help you just the way he has helped me.i will forever be grateful to him and always testify the good work of him to the hole world. contact him via email:dralmightyspellhome@gmail.com or call his phone/whatsapp +2347051758952 and he will surely help you to win any kind of lottery? Greetings! I've been following your website for some time now and finally got the courage to go ahead and give you a shout out from Porter Tx! Just wanted to tell you keep up the good job!